A comprehensive study by Pew Research finds that America wants more religion in our public discussion---particularly by politicians. In 2016, 40% of Americans believe politicians should talk more about religion and faith. In 2012, the same survey found only 30% believed politicians should talk more about religion and faith. This is a dramatic shift and it's consistent throughout the culture, even to the evaluation of current political leaders. Pew Research's, "Faith and the 2016 Campaign" is both comprehensive and revealing. I recommend you take a few moments and review it. It is very informative. Released a few days ago, it finds that 40% of Americans want more discussion about religion and faith from politicians, particularly those running for president. Only 27% say there is too much discussion about religion. Significantly, the same survey in 2012 found 30% thought there should be more discussion about religion and 38% thought there was too much. A striking shift in thinking, and it's bipartisan. The increase in longing for more religious talk from politicians crosses party lines. Both Republicans and Democrats increasingly think there is too little discussion about religion. This year, 53% of Republicans want more discussion about religion, while only 39% felt that way in 2012. In 2012, 48% of Democrats said there was too much talk about religion and only 24% said there was too little. But now 31% of Democrats say there is not enough religious talk and 37% say there should be less. Pew also found that 68% of Americans believe religion's influence in American life has declined in the past few years, with 51% seeing the decline as bad for America, and only 13% thinking that's a good thing. Even those who identify themselves as "none," which I wrote about a few days ago, as those who do not affiliate with any specific church denomination, including atheists, were less opposed to religious discussion by political leaders. About half of Americans say it's important to them that a president share their religious beliefs, however, it is more important that their right to personal religious beliefs be protected. As America's longing for more religious discussion has increased rather significantly, their opinion of President Obama's personal beliefs and faith have dramatically fallen since 2007. In 2007, 91% of Americans believed Obama was a religious man. Now only about 60% consider him to be religious. Yesterday morning I wrote that President Obama would visit the Baltimore mosque later in the day. Indeed he did. And he told the Muslims, "Islam has always been a part of America," noting that among the African slaves brought to America, many were Muslim. The president noted that Thomas Jefferson wrote in the Virginia statute for religious freedom that the "Mohammedan" should have his faith protected in the United States. No wonder people are questioning the president's religious faith. These are half truths. He implied that many, perhaps a majority of the slaves brought to America were Muslim. While some were because they had been coerced to claim Islam by leaders in their own countries, most converted to Christianity when introduced to it, giving us the spirituals many still sing today. Thomas Jefferson's commitment to religious freedom certainly did extend to the Muslims. The reason he emphasized it in the Viriginia statute for religious freedom was to underscore that religious freedom in America was extended to all religions, even Muslims who were at war against other religions. President Obama also told the Muslims at mosque that American Founders Thomas Jefferson and John Adams both had their own copies of the Koran---another half truth. While they did have copies, it was not a sign of embracing Islam as the president implies, rather it was to study it to become better prepared to deal with Muslim pirates that were wreaking havoc along the Barbary Coast and negatively impacting US commerece. The president also suggested that Jesus' command to "do unto others as you would have them do to you" is parallel to the teaching of Muhammad and is prerequisite to entering Paradise. The truth? Being nice is not the path to Paradise or eternal life. Jesus, not Muhammad, is the only way to God. And Jesus said, "I am the way, the truth, and the life. No one comes to the Father except through me"(John 14:6). 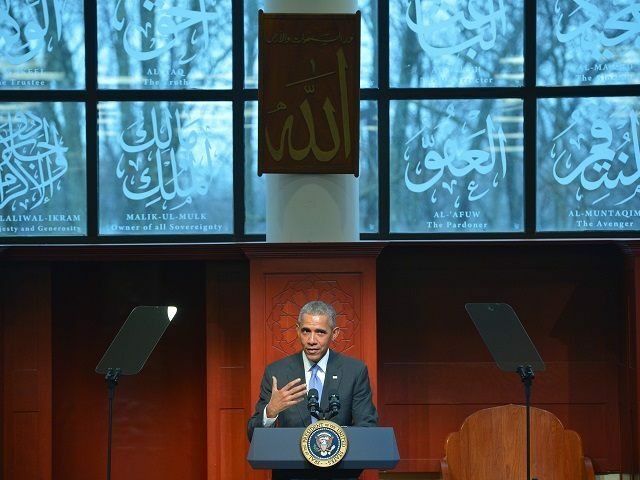 In conclusion, President Obama reiterated that Islam is a religion of peace saying, "May God's peace be upon you..."
The president's words and innuendo will be praised and parsed today on talk radio and elsewhere by both the Right and the Left. There is a growing desire for more information about religion. In fact, in the spirit of this renewed longing for "more religion," the Washington Post published a feature article titled, "Why Bernie Sanders Doesn't Participate in Organized Religion." The Post says, "Growing up, Bernie Sanders followed the path of many young American Jews. He went to Hebrew school, was barmitzvahed and traveled to Israel to work on a kibbutz." "But as an adult," the Post explains, "Sanders drifted away from Jewish customs." Sanders, the Post says, rarely discusses his religious views, but tells the Post, "I think everyone believes in God in their own ways. To me, it means that all of us are connected, and that we are all tied together." When Jimmy Kimmel, host of a late night TV talk show, asked Sanders whether he believes in God and whether it matters to the American people, he seemed to want to avoid the question, but said, "I am what I am. And what I believe in, and what my spirituality is about, is that we're all in this together." He says, "I want to be treated with dignity and respect, and I want other people to be treated with dignity and respect. I think it is important that a sense of morality be part of our politics." Bernie's brother, Larry Sanders, tells the Post his brother is "quite substantially not religious." Yet Sanders said in a recent speech: "I am motivated by a vision which exists in all the great religions---in Christianity, in Judaism, in Islam, Buddhism and other religions---which is so beautifully and clearly stated in Matthew 7:12. And it states," he continued, "'So in everything, do to others what you would have them do to you, for this sums up the law and the prophets'." There's more about Sanders in the Post story. I found it interesting and informative. But here's my concern, and the reason I'm writing about this. Sanders--- as Obama, as Muslim leaders and a host of other political leaders--- often refer to "treating others as you want to be treated" as the high watermark for religious commitment and morality. And in some cases, being nice is presented as the path to paradise. Half truths are the sharpest tools in Satan's workshop. In fact, there is an old Yiddish proverb that says, "A lie that is a half truth is ever the blackest of lies." It all started with this: "Has God indeed said 'you shall not eat of every tree of the garden'?" As Eve explained they were free to eat of all the fruit except....and that if they did eat, they would die. Satan's response: Surely you won't die, because God is a good God, a loving God. In fact if you eat the forbidden fruit you will be as wise and morally informed as He is---you will become like God, knowing good from evil---with the suggestion Eve and her husband won't even need God anymore. As religion becomes more desirable, more versions will emerge. Don't be deceived. God is love, but His plan for humanity is redemption from sin, not affirmation of the sin. God calls us to unity in Him---not in shared values. As the desire for more religion increases, it creates a growing opportunity to share the gospel. I believe God is about to do something significant. Be Faithful. Be Vigilant. Be Discerning. Be Prayerful. Be Bold. An enemy hath done this.